At the link you can download the free plans to build this doll house and as an added bonus you can download the free printables for the furniture too. 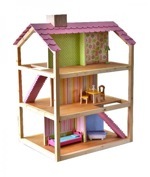 Build this doll house and give a child endless hours of enjoyment. Here are the free woodworking plans. Build this 5 room doll house which features a spiral staircase and lift off roof as well as easy access for play through two opening doors that span the front of the doll house. Doll House Bookcase free project. This is a link to a Google 3D SketchUp drawing for a childrens doll house bookcase. You will need the SketchUp software to download this drawing and its freely available online. Doll House free woodworking plan. This is a free doll house plan for a fun doll house that comes apart and stores flat. Free plans available at the link. Build a three story dream dollhouse perfect for 12 inch dolls with these free easy step by step do it yourself dollhouse plans! Just scroll down the page at the link to find the plans. Delight your children with this modern dollhouse! Customize to suit your childs needs.